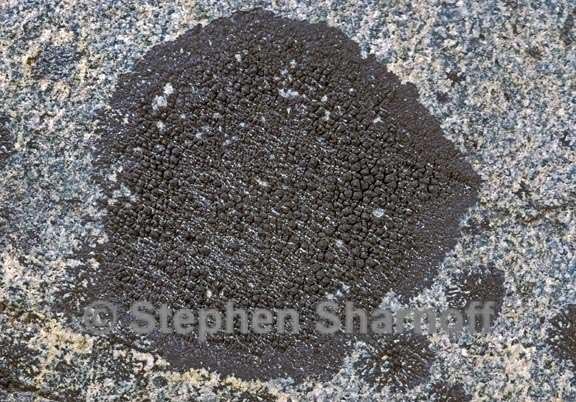 Thallus: crustose, thin or thick areoles: central ones thicker and larger than the peripheral ones, marginal ones may be contiguous and appearing radiate or becoming separate and dispersed-radiate surface: brown or blackish brown, shining or dull prothallus: sometimes present (particularly on quartz substrates), blackish, cobwebby Perithecia: entirely within the central thallus verrucules, 0.4-0.6 mm wide, only the mouth visible, simple; exciple: hyaline, surrounded by a dark thalloid layer between it and the involucrellum involucrellum: prominent and black, curving around most of the exciple; hypothecium: hyaline; hymenium: I+ blue asci: saccate, 2-spored ascospores: ellipsoid or narrowly ellipsoid, brown, muriform, up to 9-septate transversely and 3-septate longitudinally, 24-50 x 11-21 µm Spot tests: all negative Secondary metabolites: none detected. Substrate and ecology: a species of irrigated depressions World distribution: Eurasia, Greenland and western North America Sonoran distribution: Arizona and California in the mountains from 150 to 3700 m. Notes: As noted in Thomson, (1991), when growing on smooth substrata this species is easily distinguished from Staurothele areolata, but on rough substrata the distinguishing smaller areoles of the periphery are harder to note. The fruiting and sterile areoles in S. areolata are nearly of the same size and abruptly cease at the margin, unlike the presence of the smaller, more rotund marginal areoles in S. drummondii. In Hasses Exsiccati 237, it is reported as Endocarpon wilmsoides.